Top venue for great food, drinks and entertainment, the biggest little place North of the river! My wife had been away on a business trip over East for a few days. On her return, we decided we would get away from the household distractions to spend a bit of time catching up; we decided to head to Leapfrogs Café in Joondalup. Leapfrogs Café is part of the Wanneroo Botanical Mini Golf complex which has developed a great reputation over the years as a fun thing to do, no matter your age. The mini golf course is both challenging and unique, in that it has been placed around the beautiful botanical gardens which were designed and planted by landscape architect Theo Puik and his wife Hanneke over a 35 year period from 1974. The family business is now owned and operated by the Hanneke's daughter, Nicole, and her husband Paul Woodcock. Over the past few years, they have been building up the café side of the business and they are doing very well; it seems each time we visit Leapfrogs, there has been a little more added to the restaurant. Design you own toppings for the most flavoursome wood fired pizzas. The latest addition is a marquee, which has brought some of the outdoor area undercover. They have always provided ample gas heaters to keep the customers warm, but now there is also a large open fire surround by chesterfield couches - a very comfortable and makes for a fantastic atmosphere. The fire place was very popular last night, being that it was such a cold night. It (the fireplace) seemed to have mystical powers, as it brought people together as strangers, only to see them part as friends. 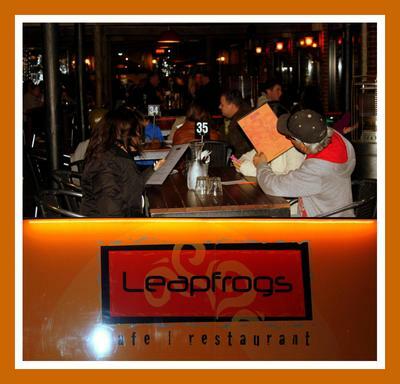 Try something from Leapfrogs Gourmet Pizza selection, you will not be disappointed. The food at Leapfrogs is fantastic. At the back of the open area are two wood fired pizza ovens which are kept very busy as diners design their own toppings from the checkbox menu. We opted for one of Leapfrogs Gourmet pizzas for our entrée, Prawns with Coriander Pesto and Mushrooms . It was delicious. Prawns with Coriander Pesto and Mushrooms = YUM YUM. But it is not all pizzas, as good as they are. There is also an a la carte menu on offer and they have daily specials, which we chose for our main, an oven roasted Beef Eye Filet with Potato Gratin and Asparagus, finished with a red wine jus. Beautifully cooked Beef Fillet that just melted in your mouth! The steak was cooked to perfection and just as we ordered it. It was so tender and packed full of flavour. The potato gratin was divine - thin slices of layered potato baked in a creamy garlic sauce and the asparagus was tender but still had a nice crisp crunch as you bit into it. For dessert, we again venture to the specials menu, choosing to share a Vanilla and Chocolate Mocha Coffee with Frangelico, finished off with a Flake chocolate crumbled through and over the top. The dessert is a take on an affogato. We were to learn later that it had been created by the waiter that took our order - it was totally sinful, but oh so good. Jay performing @ Leapfrogs Cafe; what a wonderful night. The entertainment for the night was provided by Jay Weston, Jay is one of Australia's fastest growing new talents. His voice is outstanding, and having been trained in classical music, he is capable of a wide variety of styles, including opera, classical and contemporary music. Last year, Jay sang for the Queen at the CHOGM Big BBQ which was held at the Esplanade in Perth, in front of a hundred thousand strong crowd. He has performed in musical theatre productions such the Mikado with the Queensland Opera Company and Lohengrin with the Australian Opera Company at Sydney Opera House, but my favourite of all of Jay's performances, is and always will be when he performed at our wedding! Jay stopped by during one of his breaks to say hello, whilst I put the finishing touches to dessert. Jo warming up by the open fire; it was a cold night. He opened last night's show with Elton John's "Beautiful in my eyes" followed by Nat King Coles "When I fall in love". He went on to sing other classic hits from the likes of Eric Clapton and Roy Orbison. But he really brought the whole place to a standstill when he sang his version of Hallelujah. His performance of this number is simply outstanding, there were a lot of people in the audience that suddenly realised just how good the talent was before them this evening. Very relaxed and comfy by the woodfire - it was a great spot to enjoy Jay's performance. Considering it was such a cold night in Joondalup, at 2 degrees celsius, it was freezing to be outdoors. I think stands as a great testament to Leapfrogs and Jay Weston, in the fact that so many people not only came out to enjoy themselves, but the fact that they were still there well past 10:00 pm when Jay wound up his gig, only to be asked for one more song. Being the professional he is, he delivered not one, but 5 more numbers which saw everyone up and onto the dance floor. It was a great way to end the night. Classics such as Pretty Woman saw the dance floor fill up fast! Leapfrogs is located at 25 Drovers Place Wanneroo in the Wanneroo Botanical Gardens complex, they are open seven days a week for mini golf and the café serves breakfast, lunch and dinner at various times. Phone 9405 1475 to book a game of mini golf or to reserve a table for breakfast, lunch or dinner. For more information visit the following WebPages – Wanneroo Botanical and Leapfrogs Café. Jay Weston is currently contracted to perform during cruises with Silver Sea Cruise Liners, and has a busy schedule in Perth performing at various locations between cruises. He is an accomplished pianist, arranging and performing his own accompaniment on his keyboards. To date Jay has produced four CDs for which he has produced and performed all the musical arrangements. Visit Jay's WebPages for more information of his upcoming gigs at Jay Weston. Cost: Pizza from $20, a la carte $15 - $40 approximately.